In many ways, Savannah is the quintessential city of the American South. No matter what flavor of Southern you’re looking for, chances are that you will find it in Savannah. On the one hand, it is a city that exudes and celebrates its history, Southern architecture and traditional attitudes. On the other hand, it leavens its Deep South ambience with an eclectic mixture of urban excitement, upscale cuisine, Lowcountry sensibility, and New South industry and commerce. 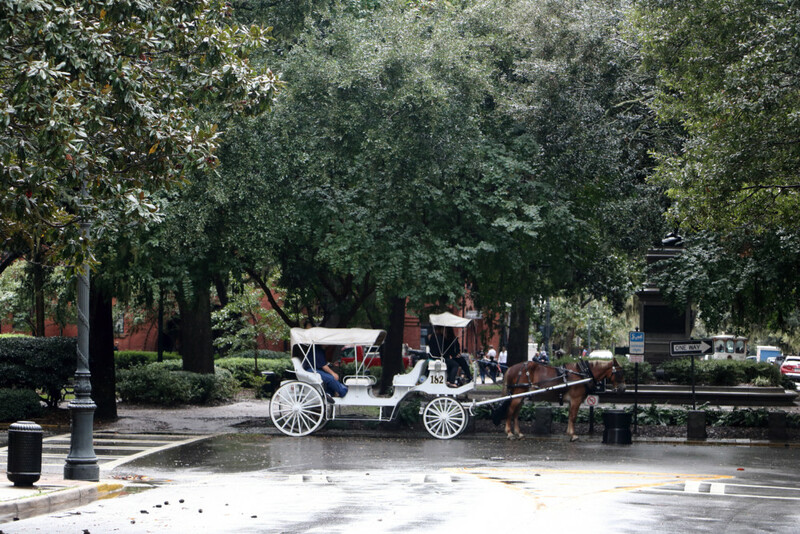 Savannah’s Historic District, relatively compact and walkable, is truly Old South. It is filled with live oaks and magnolias, more than a score of charming squares surrounded by classic antebellum structures, old cemeteries, museums and ghost legends. It extends down to the lively riverfront district on the Savannah River just across from South Carolina. New Savannah is filled with contemporary art, bars and nightclubs, craft breweries, upscale restaurants, and a passing parade of giant container ships and other signs of bustling commerce at the busy, growing port. New and old coexist along River Street and seem to run together in many places in town. It is common for old buildings to maintain their historic facades but be repurposed as restaurants, museums and galleries. Read “Midnight in the Garden of Good and Evil” by John Berendt for a good sense of the city’s history. Savannah can be easily reached by highway, air or train. If you are driving, Savannah is about 250 miles from Atlanta via Interstate 75 south to I-16 east. By air, Savannah/Hilton Head International Airport is 10 miles from downtown. It is served by six airlines and offers nonstop flights to 21 cities, including Atlanta on Delta Air Lines. Savannah’s Amtrak station is 3½ miles from the Historic District. Amtrak’s Silver Service/Palmetto trains running to New York and Florida serve Savannah and nearby Jesup daily. But no service runs directly between Atlanta and Savannah, so it’s a long trip with train changes and/or buses. There is no regular cruise ship service to Savannah’s deep-water port. Walk along River Street and enjoy the shops, restaurants and bars. • Take a narrated tour of the city on a hop-on, hop-off trolley, carriage, helicopter or Segway. Many operate after dark. Visit the port and waterfront via a riverboat cruise for lunch, dinner or sunset. • Explore the Historic District and take in the Southern architecture and ambience. • Take a ghost walk or ghost tour by trolley. The Georgia State Railway Museum. Tybee Island’s beaches, 18 miles away. Hilton Head Island and the South Carolina Lowcountry. Dress casually (not sloppily) for touring and dining, and be mindful of the season. A wrap is helpful in winter. Bring bug spray and sunscreen. Resort casual is appropriate. Mobility level — Low to moderate. Although there are some cobblestone streets and a grade down to the river, most of the city is flat, and alternative mobility options abound. When to go — Savannah lies on the Southern coastal plain. Sea breezes are plentiful, but summers are long, hot and humid. Winters are mild. July and August are usually hot and rainy, but not all day. Rain showers did not dampen our enjoyment when we were there. • Where to stay — The Suites at Bay (on Bay Street, one block off the river and at the edge of the Historic District) is convenient and has nearby parking. New hotels include the Cotton Sail, and most of the national chains have properties in town. Where to eat — The Olde Pink House is excellent. We loved its Cellar Tavern (www.plantersinnsavannah.com/the-olde-pink-house). We also enjoyed the Cotton Exchange Tavern on River Street. Excellent eateries are found around River Street and the Historic District. Special interests — Southern history and architecture and Lowcountry cuisine. Jeff Orenstein, a syndicated travel writer from Sarasota, and his wife, Ginny, enjoy simply smart travel and sharing their trips and tips with you. See their travel tips, photos, articles and blog at www.SimplySmartTravel.com and like them at www.facebook.com/SimplySmartTravel. Savannah is a city that oozes history, including a significant and enduring Jewish history. Its first congregation, Mickve Israel, dates back to a band of about 40 Sephardi Jews who arrived with a Torah in 1733, gained permission to stay from James Oglethorpe and immediately composed one-third of the population. The group convened a minion upon landing and set up a worship center as soon as practical. Jews now represent about 2.5 percent of Savannah’s people. Anti-Semitism, although present at times in the city’s early history, has not played a significant part of Savannah’s modern history. Jews have served as judges and mayors and are involved in many of the community’s prominent social organizations. Moreover, Jews generally are accepted as part of the city’s historical fabric. Significantly, the current Gothic Revival building of Mickve Israel, built in 1878, lies in the heart of the Historic District and is a prominent part of narrated historical tours. In addition to Reform Congregation Mickve Israel, Savannah has Conservative Congregation Agudath Achim, Orthodox Congregation Bnai Brith Jacob, the Savannah Jewish Federation, a Hadassah chapter, a Jewish preschool, and the Jewish Educational Alliance, which has several athletic teams. Kosher food is available.